Break out your skinny ties and duct tape; the 80’s are back. It’s been twenty years since the airwaves were filled with the sounds of synthesizers, so the time is right for a new wave of New Wave nostalgia. From its opening burst of static it’s obvious that the Epoxies are all your favorite bands from 1982 rolled into one. 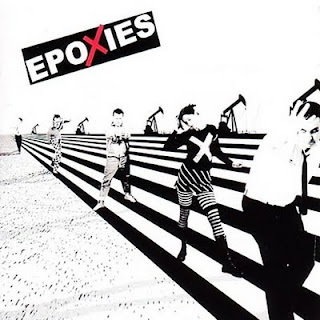 Filled with the beeps and blips of electronic keyboards, the Epoxies self-titled first album continues the musical heritage of Devo, Thomas Dolby, the Vapors, and Gary Numan. Lyrically, they exist in a world of plastic and glass, looking for love amidst the nuclear fear of a Cold War era. But it is the voice of singer Roxy Epoxy that is the most evocative of the period. With slight changes of inflection she is able to summon the spirits of Blondie, Missing Persons, and Bow-Wow-Wow. Throw aggressive drumming and the signature Adam Ant tribal yodel into the background and the package is complete. While the Epoxies wear their influences openly, they manage to make it all seem fresh and exciting again. The challenge is to continue to do so without devolving into a Sha-Na-Na like novelty act. Wayne Wise They released a self-titled album and a second full-length release called Stop The Future. Singer Roxy Epoxy formed a new band called The Rebound and released Bandaids on Bullet Holes. I saw The Epoxies three times in about a year at the Rex Theater on the South Side and met the band. The shows were great. See what Roxy's doing now at her website. According to my archives, the article was in the July 4, 2002 issue of Pulp. I'm glad you archive my stuff better than I do.